Eye: Golden sparkling copper color. Nose: A rich, luxurious aroma of caramelized pear and banana. A light sweetness turns into coconut and vanilla, and a spicy menthol scent. Palate: Gourmet, round and incredibly silky. There are fresh flavors of ginger and white fruits like plums. The smooth finish of a toasted oak cask fills the mouth in the end. This innovative eau-de-vie from Martell is made by finishing their acclaimed VSOP Cognac in Kentucky Bourbon barrels. 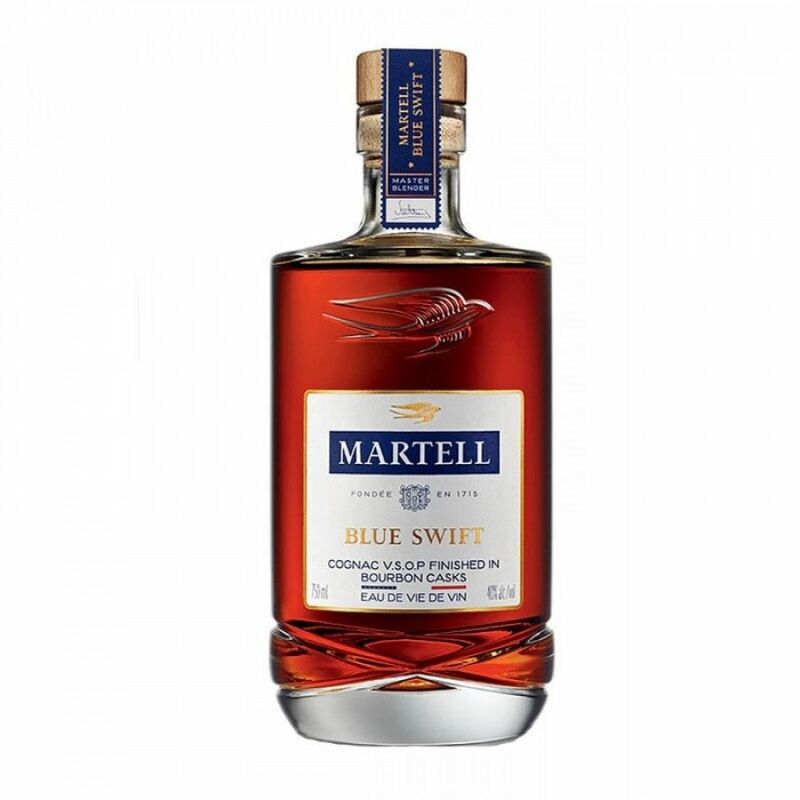 The Martell Blue Swift VSOP has been described as uniting two worlds; it is simultaneously olde-worlde with its Bourbon cask glass shape, and also new and innovative in the way that it experiments with traditions of Cognac production dating back centuries. If you’re a fan of a richer, toasted and rounded flavor, then this is the eau-de-vie for you. It cannot be called Cognac, as the latter must be aged in French oak to qualify as so. Instead, it is an “eau-de-vie de vin”, which quite literally translates as a distilled grape wine spirit. Martell pride themselves upon their impurity-free distillation process, which is signature to the Cognac maison. This makes it all the more ready to absorb aromatic qualities from the bourbon casks. The Blue Swift VSOP commemorates the fact that Martell was indeed the first Cognac house to ship barrels of spirit to America from 1783.Their reputation as the oldest of the Cognac houses, dating back to 1713, means that Martell work tirelessly to ensure that their stellar reputation as one of the best Cognac producers in the world is constantly challenged, updated and exceeded. 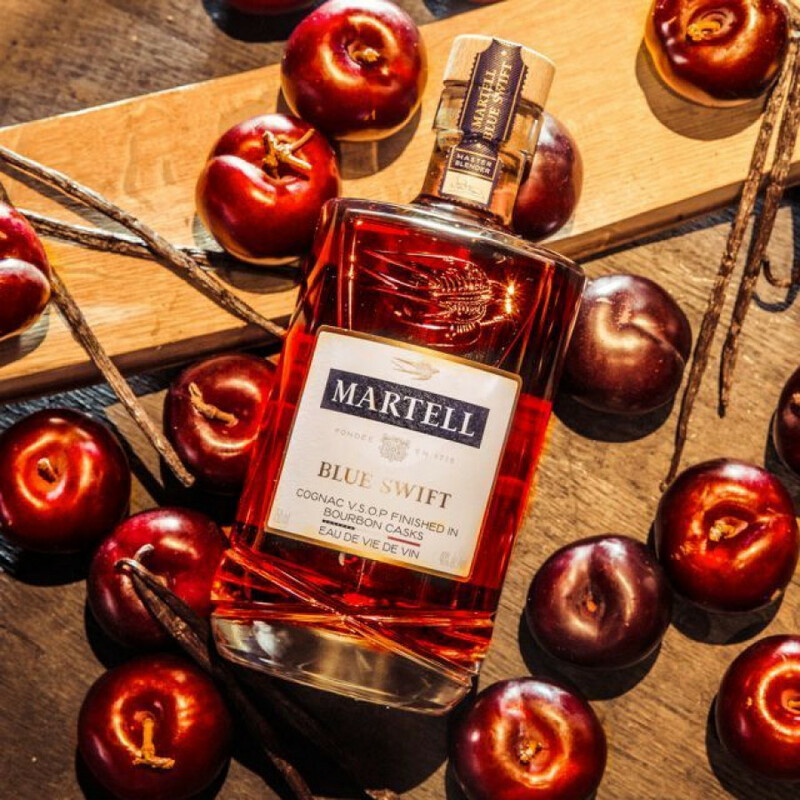 The Martell Blue Swift successfully reinvents the Cognac genre, bringing curiosity and ingenuity to the long-standing craft. 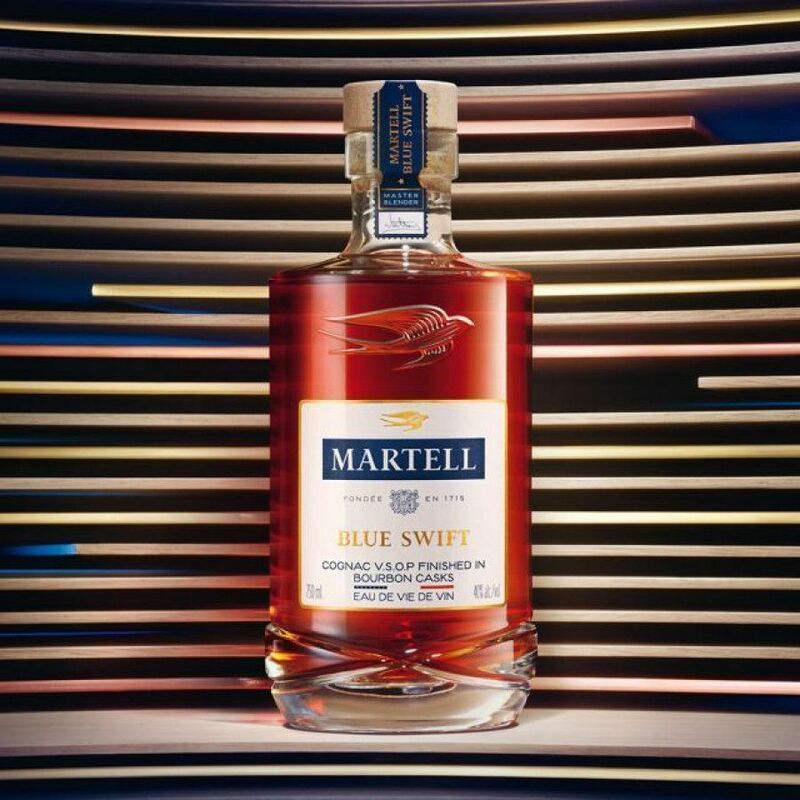 It is only fitting that Martell have decided to call this liquor the Blue Swift, after their iconic logo that appears on all of their bottles, and features heavily in a number of their marketing campaigns. The blue swift represents the spirit of the Cognac house; one that flies freely from continent to continent, traversing oceans and bringing the French art of Cognac to the US and vice versa. With signature notes of plums and candied fruits, it brings a new twist to traditional notes with flavors of toasted oak and vanilla. We recommend serving it neat, in a classic cocktail or on the rocks. It is highly versatile. The bottle has a delicate “cut glass” detail on the base that makes it seem like it could be a crystal decanter. Disclaimer: Even when it says "Cognac Age" above, of course it should be "Age" from a legal point of view, because it is not a Cognac. I started with the V.S. and moved up to the blue swift. I see why it's not called a true congac and even though I usually drink Hine this has become my go to congac. It may be aged in Kentucky barrels but being from N.C. all I can say is it gives it a unique taste I prefer on occasion over hennesay, and the other popular 3.